Stem to Stern [ISSN xxxx-xxxx] is published annually by East Carolina University' Program in Maritime Studies . Our collection is incomplete. Covers many aspects of rarcheology and maritime environment, as well as the University's academic programs and interests. 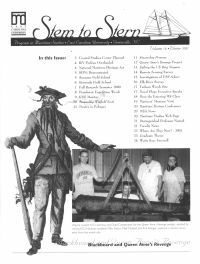 The cover of the Winter 2001 Issue (Volume 16) features a photograph of a cannon recovered from the Queen Anne's Revenge. We are actively endeavouring to complete this collection, and may have some duplicates for exchange or possible sale. Please contact us for donations or exchanges.